Moong dal chilla recipe– easy and quick north Indian breakfast recipe made with whole green gram or moong dal. Moong dal cheela is especially an excellent dish for kids lunchbox also. Moong dal cheela is especially an excellent dish for kids lunchbox also.... Oats chilla recipe – A quick, healthy and delicious oats recipe for Breakfast under 20 minutes. This oats cheela is similar to Besan ka cheela, spiced pancakes made with chickpea flour. Oats chilla recipe – A quick, healthy and delicious oats recipe for Breakfast under 20 minutes. This oats cheela is similar to Besan ka cheela, spiced pancakes made with chickpea flour. how to make a pirate shirt from at shirt What Is Pudla? It’s a type of Besan Chilla which is a bit thick and crispy. I make my Pudla in many ways and when you start making it, you can make lots of variations of it. Besan cheela also called as vegetarian omelette, is a gluten free Indian savory pancake crepe. It is a perfect breakfast dinner recipe. I have given this recipe for the kungumam thozi supplement, 2 years back. In that i have added oats flour and besan flour to make it even more healthier. I have heard about this besan ka chilla … how to make sweet peas Instant besan chilla is a crispy crepe made with chickpea flour with paneer stuffed to make a filling, tasty and quick breakfast/ snack or dinner. I make besan cheela or chilla very often. I love it a lot with all the ingredients we add for making bajji/ pakora. Besan Ka Chilla is an easy and tasty breakfast. Gram flour based salty and nutritious pancakes are surely loved by everyone. It can be served as evening snacks as well as you can serve it during breakfast also. In a large mixing bowl, sieve the besan. Add a tablespoon of water to the hing and mix it into the batter. 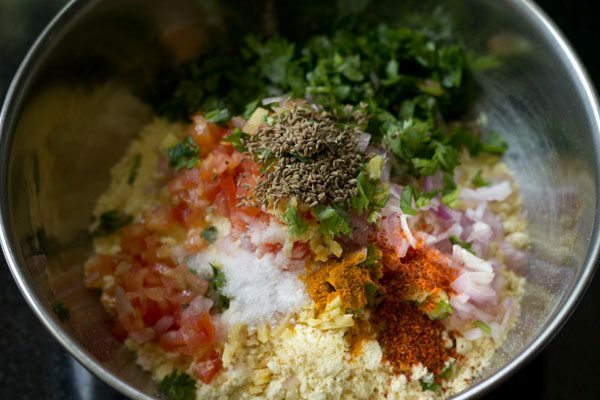 Add salt,cumin seeds, turmeric powder, chili powder, chopped onion, chopped green chilies, curd, chopped tomatoes and coriander leaves. Besan cheela recipe or besan ka cheela recipe - It is a quick and easy to make Indian breakfast or great evening snack with a cup of tea.